Home > Upcycle Crochet > How to Make Plarn + Some Fun Plarn Projects! How to Make Plarn + Some Fun Plarn Projects! 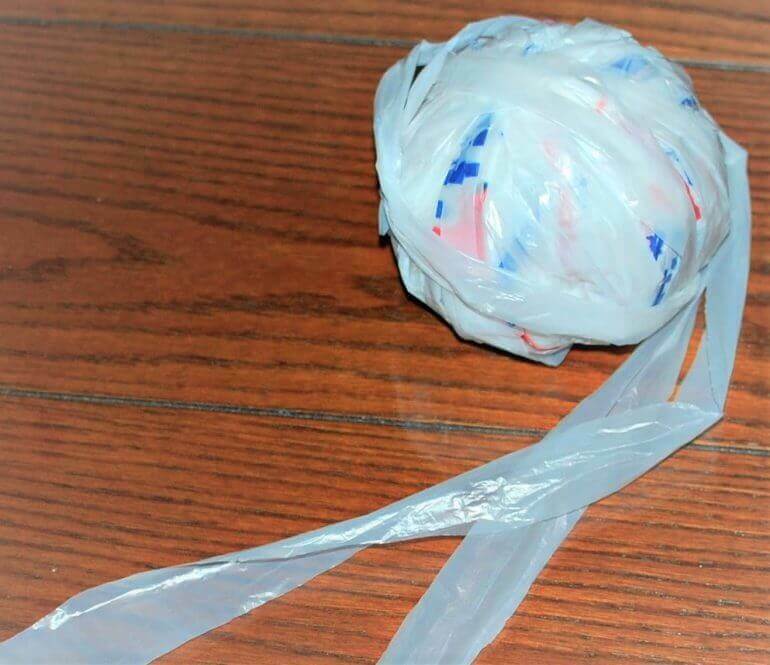 Learn how to make plarn to recycle that pile of plastic bags in your closet and turn them into some really cool creations! Read on to see how to make plarn. 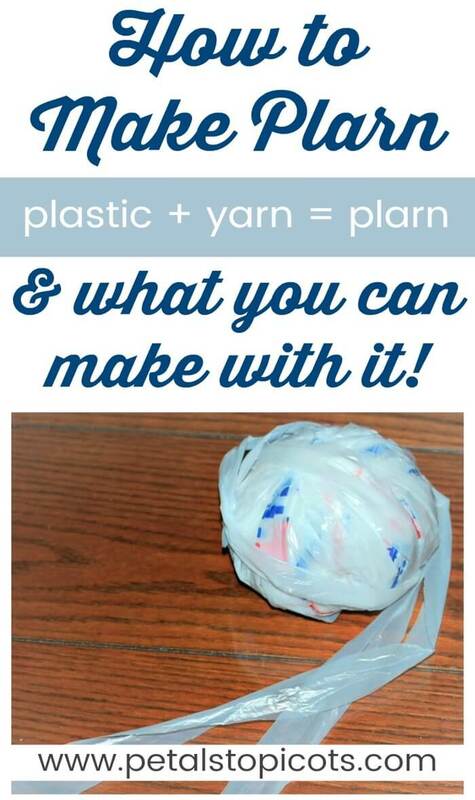 Wondering what to make with plarn? No worries, I have links to some fun plarn projects for you to try. I’m always looking for ways to reduce waste and reuse and recycle what I can. Although I try to use reusable bags whenever I go grocery shopping, I inevitably forget once in awhile and end up with a stash of plastic bags. So what better way to use them than to make plarn and crochet them into something new! To put it simply, plarn is plastic yarn. Plarn is made by cutting plastic grocery bags into strips and tying them together to create plastic yarn, or plarn. Some of the benefits of using plarn, aside from the positive effects on the environment, are that finished items are surprisingly durable and can be washed in warm soapy water and reused again and again. And what are those finished items? You can use plarn to crochet items such as doormats, tote bags (like this super-easy grocery tote crochet pattern), knee pads for gardening, dish scrubbers, storage baskets, coasters, beach bags, table accessories (like this festive outdoor placemat crochet pattern set), camping mats, and almost anything else you can think of. Some organizations are even encouraging their volunteers to use plarn to make bedrolls for the homeless. Now, I said it is good for almost anything … plarn really isn’t ideal for clothing, however. Besides that fact that it would probably not be the most comfortable thing to wear, it also doesn’t breath well. Plarn also shouldn’t be used for anything that would be used near heat, such as potholders or trivets, because it will melt. First, sort through your plastic bags and discard any dirty or ripped bags to your recycling container. Now it’s time to choose colors. You can choose bags of the same color or use a mix of colored bags for a variegated look. Or you can separate the colors to make different designs by switching colors every few rows. Step 1: Flatten your bag making sure the sides are tucked in. Step 2: Fold in half lengthwise. Step 3: Fold in half lengthwise again. Step 4: Cut off the bottom of the bag and the handles and discard to your recycling container. Step 5: Then cut the rest of the bag into 1-in. strips. Each of these strips creates a plastic loop. Step 6: Open each strip into a plastic loop. Step 7: Working with two strips, bring one end of the second strip under and through the loop of the first strip. Then bring it over and back through the second loop, gently tug to secure. Step 8: Continue joining strips to form a continuous strand. Step 9: Roll into a ball. Step 10: Make something really cool! I am going to do this and make a pad for my dog to lay on outside in her area of our yard. Might be major problem with plarn: plastic bags are being made biodegradable – so all your crocheting or knitting will be for naught since the bags are supposed to disintegrate. Is there any way to soften it? It is so stiff. Not that I know of, Molly. plarning plastic bags into sleeping mats for the homeless. Just yesterday a male friend of mine was using a popcan cover made out of plastic bags (plarn). I looked at the pattern and think I can recreate it, and I am so excited to find this tutorial, since I probably would have done a whole lot more cutting. Thanks!!!! I love it! Reminds me of my Mom. She made use of everything she could out of whatever she could get her hands on. I think she was the original recycler!! I especially liked her Plarn and Rag Rugs at every door. Sure was easy to just hose em off and hang them up to drip dry. As we always had a garden they got a lot of muddy wear and tear 🙂 Thanks for the memories!! That is a great way to be 🙂 I love thinking of new ways to use things. Thanks for your sweet comment! OMG! This is the best thing ever for my library! My husband always gives me the bags from places like T and W. The ones with food, he recycles. I use them when it rains for our patrons,to protect the library books but some of the books are heavy and I end up using 2 bags. This just fixed all that! THANK YOU SO MUCH. And please remember to SUPPORT YOUR LOCAL LIBRARY! I hope you don’t mind, but I have copied off your instructions, enlarged the font, and photos for my 88 yr old Mom. She’s blind in one eye due to macular degeneration and can no longer work with crochet thread, but thinks she can see welll enough to make some of these totes for the church bazaar this fall. What size crochet hook works best? A larger hook works best, such as an M or N hook. Thanks for sharing this tutorial and the pattern as well. I sponsor a Fiber Arts Club at the middle school where I teach. I think this will make a good Earth Day project for this month. What a great idea!! I wish you much success! Thanks for including in your post! Very cool! This is one of the best ways to recycle plastics. You can use it in making yarns. It is important to recycle plastics in order not to ruin our environment. Thanks for the instructions on making Plarn. This is so amazing! I would love to feature it on Reduce, Reuse, Upcycle. Feel free to stop by and grab a featured button. Thanks! Oh I can’t wait to see the plarn tote bag! And thanks for adding a new word to my vocabulary! Can’t wait to try it out and see who knows what it means! Hi Sharon! I’m glad you liked it. Make sure to check out the finished tote 🙂 Thanks for stopping by! Also – I am awarding you with the Versatile Blogger Award. Your site is awesome. Stop by my recent post “Versatile Blogger and Versatile Blogger(cont.) to see what its about! Congrats! I am a new follower to your blog, can’t wait to get new ideas! this is a really nice idea. I like it. just the other day I was complaining about taking the 500 million plastic bags I have to walmart to recycle them… might have to keep them and use them for this instead. This is very cool I am featuring you tomorrow! Stop by and grab a button! And I would love it if you would link something up agian! A very green great idea.. Thanks for sharing at craftionary.. I made a plarn bag before. My sister said it doesn’t look like it’s plastic bags! It’s pretty and strong. I go crazy over recycling! New follower. oh Nice. It can be a great recycling & reuse..
My grandmother used to make rugs for kitchen out of plastic bread bags, they lasted forever, machine washable and line dry.